But which new refrigerant, and when? Competing goals lead to indecision. Now that the Environmental Protection Agency has finalized the country’s R-22 phaseout plan, super­market refrigeration teams are trying to come to some conclusions about when and how to get out of R-22. The decision has gotten more complicated in terms of both replacement refrigerants and timing. Many years ago, companies wanting to get a head start on R-22 retrofits only had to choose between R-404A and R-507A. Both were good for the ozone layer, but disastrous for the climate. Both more than doubled a system’s direct greenhouse gas impact. Of course, the broad majority of the population didn’t care much about climate change back then, and those who cared didn’t have any other alternative anyway. The refriger­ant choice wasn’t good, but it was clear. In terms of timing, it was also clear that retrofits needed to be carried out before R-22 became scarce and expensive, so carrying out retrofits at a steady pace was key. With the advent of the 407 series of refrigerants at the beginning of this decade, companies that cared about global warming had better refrigerant options in R-407A and R-407F. They were good for the ozone layer, and they had similar global warming potentials to the R-22 they were replacing. With the public’s interest in climate change on the rise, and pilot studies of the 407 series refrigerants indicating energy parity and an easier retrofit process, the choice was again clear: All retrofits should be carried out with one of the 407 series refrigerants. Supermarket companies retrofit­ted their leaky R-22 stores as they came up for remodel.Many years ago, companies wanting to get a head start on R-22 retrofits only had to choose between R-404A and R-507A. Both were good for the ozone layer, but disastrous for the climate. Both more than doubled a system’s direct greenhouse gas impact. Of course, the broad majority of the population didn’t care much about climate change back then, and those who cared didn’t have any other alternative anyway. The refriger­ant choice wasn’t good, but it was clear. In terms of timing, it was also clear that retrofits needed to be carried out before R-22 became scarce and expensive, so carrying out retrofits at a steady pace was key. Nowadays, companies have refrigerant choices galore, and while that is a good thing generally, it sure doesn’t make the decision process easy. The EPA has proposed to disallow the use of R-404A and R-507A for retrofits as of the beginning of next year. There are plenty of better choices. In addition to the 407 series of refriger­ants, the chemical manufacturers are bringing HFO blends onto the market that are suitable for use as R-22 replacement refrigerants. These blends have less of an impact on climate than the 407s, but they still aren’t exactly what one would call “low GWP.” Many supermarket companies are piloting the HFO blends now, so the industry should have good data available on the ease of the retrofit process with these re­frigerants, as well as the verdict on their energy efficiency. The difficult decision lies in the fact that the chemical manufacturers are already hinting at the future avail­ability of HFO refrigerants that have little or no impact on global warming. That means that refrigeration teams face the decision of whether to retrofit into 407 or an HFO blend now, or if they should wait to retrofit when the really good choices for climate are available. I’ve even heard suggestions that the best thing the EPA could do for the environment is to postpone the R-22 phaseout for a year or two. That way, supermarkets will be able to retrofit right into the best refrigerants for climate, as opposed to having to settle for a short-term solution that might, in and of itself, be on the EPA’s hit list of high GWP refrigerants later. The suggestion reflects a lack of understanding of how the EPA rule-making process works, and there is zero chance that the EPA will postpone its phaseout plan. But supermarkets still must choose whether to postpone their retrofit plans based on the later avail­ability of better alternatives. It’s hard to know the best course of action. If it’s any consolation to those who face these compli­cated choices, there are plenty of supermarket compa­nies not even thinking about R-22 retrofits yet. Before anyone refers in envy to the cliche that ignorance is bliss, consider the problems these companies are going to have in the future. Sticking one’s head in the sand is often temporarily easier than facing the problems at hand. Yes, the decision-making process is simpler for those people, but that is often because short-term inde­cision results in the lack of choices later. And the worst choice is always no choice. People ask me all the time if the EPA is ever going to get off their backs about the refrigerant they use. My answer is always the same: The only way that will happen is if the industry stops using refrigerants that harm the environment. For the first time since the EPA started regulating refrigerants in supermarkets, it is possible for a supermarket to operate using 100% natural refrigerants. With the use of CO2, we have a refrigerant that is safe for the ozone layer and for our climate. The EPA’s refrigerant regulations for supermarkets were originally intended to reduce the harm that these refrigerants did to the earth’s ozone layer. More recently, the regulations have been used to minimize the global warming impact of refrigerants used in supermarkets. However, refrigerants that help the ozone layer are very potent greenhouse gases, so many grocers fear they are just substituting one environmental problem for another. And more importantly for some, this means that they are doomed to an endless cycle of EPA-mandated refrigerant phase-outs in the future. There is only one way to be sure that you won’t ever have to go through another refrigerant phaseout: Use natural refrigerants in your store. The natural option that most people are turning to is CO2. Why? Because it’s a good option. Besides the advantages that have been documented in hundreds of stores throughout the world, as well as the low cost of the CO2 refrigerant, the refrigerant has other pluses. What is the financial value of future-proofing your business against yet another refrigerant phaseout? How much is it worth to not have to worry about Section 608 compliance in a store that uses CO2? Though it’s hard to say what an average phase-out and the resulting retrofits cost a company, it’s safe to say that it is usually in the millions. If you have enough stores, it can easily be in the hundreds of millions. The value of not having to worry about Section 608 inspections in your store is more a question of peace of mind, rather than an actual quantifiable monetary savings. Let’s face it, you’ll probably continue to keep refrigerant leak records on your CO2 stores because that is a part of good financial management. But don’t underestimate the value of peace of mind. It’s hard to even imagine what it’s like to not worry about EPA compliance. Regulations have been in place for decades, so a good percentage of people in the refrigeration industry today have never experienced a world free of worries about Section 608. We can’t retrofit our way out of the world’s refrigerant problem. The only way to solve the problem is by building stores that use refrigerants that don’t cause these environmental problems. Yes, it’s true that if we rely on new store construction to solve the problem, it will take several decades for existing stores that use harmful refrigerants to reach the end of their lifespan. But we can’t continue to use the same harmful refrigerants forever. And in the grand scheme of EPA phaseouts, 20-30 years is not a long time. Here’s some advice for supermarkets on how to go about seeking incentive funding from utilities for natural-refrigerant projects. Accelerate America: Do you expect that utilities around the U.S. will provide incentives for various supermarket systems that employ natural refrigerants? Keilly Witman: Yes, we’ll see this happen over the next five years. Different regions will jump on the energy savings opportunity at different times. Once the early movers develop methodologies for these types of incentives, other utilities will then roll out their own programs. You’ll start to see incentives on the West Coast, then they’ll spread to the Northeast, and (hopefully) eventually spread to the Southeast. The savings opportunities for utilities are too great for them to ignore. Having said that, I think you’ll see prescriptive incentive programs for self-contained cases that use natural refrigerants before you’ll see widespread custom incentives for refrigeration systems. AA: What are the biggest hurdles supermarkets have to overcome to get these incentives? KW: The biggest hurdle for supermarkets is the amount of time and effort it takes to work with utilities on custom incentive projects. AA: Do supermarkets need third-party companies or equipment vendors to get the incentives? KW: That depends on what you mean by third-party companies. If you are talking about companies that specialize in being the middleman in these types of projects, usually in exchange for a percentage of the incentive, then I don’t think supermarkets need them. Supermarkets can certainly manage these projects on their own. It’s just a question of having the people and the time. Though they don’t need them, it probably does make sense from a business perspective for many supermarkets to use these middlemen. Its a cost/benefit question. These companies cost money, but they save you time, effort, and frustration. Whether you use a third party or not depends on where your priorities lie. If you are talking about commercial refrigeration engineering firms as third-party companies, I think it’s wise to include their help on incentive projects in their scope of work. They know the ins and outs of the systems, so they can help with a lot of the back-and-forth questions that come from the utility about the various features of the systems. That can save a lot of time for the technical people at the supermarkets who would otherwise have to answer those questions. I don’t think a supermarket needs an equipment manufacturer to help get incentives, but if I were an equipment manufacturer, I’d offer this service to my customers. These incentives help with supermarkets’ ROI calculations, which help sell systems. AA: How much lead time should supermarkets give themselves in securing incentives? KW: That really depends on the type of incentive, which utility you are dealing with, and the amount and type of resources you have available. The only thing that is certain in terms of utilities and lead time is that you always wind up thinking that you should have started the project sooner. AA: Will utilities eventually take into account the fact that leaks from natural refrigerant systems have minimal or no effect on global warming? KW: I think that some utilities will take this into account, especially in California where they regulate greenhouse gases. Municipal-owned utilities in California should look closely at the greenhouse gas savings that can be accomplished with the win-win of zero GWP refrigerants and improved energy efficiency. In areas of the country where there is no requirement to reduce greenhouse gases, most utilities aren’t interested in the slightest in the direct greenhouse gas emissions from refrigerant leaks. AA: Whats the biggest change youd like to see in the way utilities award incentives for environmentally friendly refrigeration systems? KW: There are a lot of things that I’d like to see change in the way that utilities award incentives. The biggest change I’d like to see is for utilities to get out of their own way on some of these projects. The overall impression that I get from utilities is that they tend to overcomplicate things to the point where projects take so much time and effort that supermarkets just can’t participate in the programs. This type of change would embed more accountability into the entire industry. Supermarkets would make sure that they can measure the actual energy savings, and they’d evaluate those savings vs. the energy savings claims that equipment manufacturers make in their sales pitches. You’d have more case study write-ups on the projects that worked and which ones didn’t, which would motivate supermarkets and utilities to pursue the technologies that have been proven successful. Store level programs can hide huge dollar losses from refrigeration leaks. People often ask me to name the single most effective way to cut supermarket refrigeration leaks, based on my time heading up the EPA’s GreenChill Partnership. My response usually surprises them: Your first priority should be to switch from an individual-store-based refrigerant management strategy to one that is centralized at headquar­ters. This switch produced a 10% re­duction in corporatewide leaks in one GreenChill partner’s first few months in the Partnership. This partner had more than a thousand stores and this 10% reduction equaled at least 150,000 pounds of refrigerant. Mul­tiply that by about $5.00 a pound way back then, and you get a cool $750,000 cost saving off the bottom line. What do I mean when I recom­mend shifting to headquarters refrig­erant management? Well, refrigerant management has historically been the responsibility of the individual store. In fact, Section 608 refrigerant regulations place the responsibility for record keeping and repair of leaks at the individual store level. That is the single biggest flaw in Section 608 and the reason it has largely been a failure in reducing and preventing harmful refrigerant leaks. Headquarters management shifts the responsibility for refrigerant tracking, management, and strat­egy to a central person who has the responsibility for all stores. Just to be clear: this does not do away with individual store responsibility under Section 608. I would never encour­age anyone to flout the law, even one that has as its only accomplishment the killing of trees in the name of superior record-keeping. So how did a shift to headquarters management lead to such a huge reduction in leaks in such a short period of time in the exam­ple cited above? First of all, calculating a corporatewide leak rate for the first time usually opens the eyes of the top brass to the enor­mous amount of money a company wastes on replace­ment refrigerant. And that’s the key: the realization that the best financial path is to solve this corporatewide problem. An individual store manager looks at refrigerant leaks as a cost of doing business. He or she is often unaware that something can be done about the problem, or if aware, doesn’t have the time to become a refrigeration expert to figure out how to solve it. The store manager’s job is to sell groceries. A person at headquarters who has been hired to tackle this problem would have the knowledge and the time that individual store managers lack. Centralized refrigerant manage­ment leads to quick wins by focus­ing attention on the horrendous leak rates at some stores. From the perspective of the individual stores, these leak rates are probably consid­ered normal. But a per­son who has the records for all stores sees that a small number of outliers make up a large percent­age of the leaks. He or she can target those stores as the first priority. Sometimes sending out contractors to investigate the problem leads to the simple solution: finding and repairing the leaks instead of just topping off the refrigerant every month. If the problems are more complex, headquarters can allocate funds to tackle them in other ways, includ­ing investing in a new system if that saves money in the long-term. $30,000 FINES PER DAY Centralized refrigeration manage­ment often alerts corporate officials to the potential legal liability from non-compliance with refrigerant regulations. At $30,000 per viola­tion, per day, fines can be much more expensive than investing in better refrigerant management. There are other examples of the benefits in switching to centralized refrigeration management, but they all boil down to the same premise: better companywide refrigeration management results in better com­panywide financial management. The environmental benefits are a pleasant side effect. Special interests want to expand Section 608 refrigerant leak regula­tions. But what it needs is a major overhaul. The Alliance for Responsible Atmospheric Policy, a Washington, D.C., special interest group, petitioned the EPA last year to expand Section 608 refrigerant leak repair regulations to include HFC refrigerants. The EPA’s Section 608 regulations currently apply only to ozone-depleting refrig­erants, and since HFC refrigerants do not harm the ozone layer, they do not now fall under its scope. The petition from the Alliance has many in the supermarket industry shaking their heads. Expanding Section 608 to include HFCs just takes an ineffective regulation and adds more stuff to it. The regulation already contains everything and the kitchen sink, including several provisions that most agree are pretty useless. In addition, the petition does noth­ing to solve the real problem that Ti­tle VI of the Clean Air Act is meant to address: our nation’s enormous refrigerant leak problem. The current Section 608 does not mandate that a supermarket leak less — it simply says that once a supermarket leaks 35% of its refrigerant charge, records must be kept to show that leaks are repaired within 30 days of discov­ery. In fact, it’s perfectly legal for a supermarket to double its leak rate every year. You can leak 10,000 pounds of refrigerant every year and still be fully in compliance. Many in the su­permarket industry are pretty clear on the actions they should be taking to try to solve this problem. At the risk of sounding like Captain Obvi­ous, the solution to supermarkets’ refrigerant leaks is leak prevention. Leak prevention is possible, afford­able, and readily available to every supermarket. Today. The EPA in 2008 started a program to encourage supermarkets’ invest­ment in refrigeration technologies that prevent leaks: GreenChill’s Store Certification Program. The program gave platinum, gold, and silver awards to stores that achieved very significant refrigerant emissions reductions. After three years, the program had over-performed beyond anyone’s hopes. It wasn’t just reducing refriger­ant emissions; it was preventing them. Every store that GreenChill had certi­fied as platinum had a 0% leak rate. Let me say that another way: these stores had never leaked a pound of refrigerant since they started operating. The companies behind these stores had completely changed the way they managed refrigeration, investing up front in technology that used very little refrigerant and then leaked nothing during years of operation. Some of the stores used only a few hundred pounds of refrigerant, com­pared to a typical store which uses about 3,500 pounds. One store even operated on less than 100 pounds. Gold-certified stores averaged a leak rate of 0.5%. Silver-certified stores leaked just 3.8%, compared to a typical store in the United States that leaks 25% of its very large charge size. While the Store Certification Program proved that certain refrigeration technol­ogy options are better at preventing harmful leaks, namely those that use modular chill­er units, CO2 cascade systems, and natural refrigerant technolo­gies like CO2 transcrit-ical systems, every type of technol­ogy in operation in the country was able to achieve some level of certifi­cation. Even centralized DX systems, which use thousands of pounds of refrigerant and are notoriously leaky, could be greatly improved if de­signed to the certification standards. At minimum, they reduced their charge by 50% and achieved very low leak rates, attaining silver and gold certification awards. So if solutions to the nation’s leak problem are possible, affordable, and readily available right now, why isn’t the Alliance petitioning the EPA to incorporate these solutions into their regulations? Could it be because a regulation that mandated large reductions in charge sizes and technologies that prevent leaks would result in Alliance members selling significantly less refrigerant every year? I’ll let you decide. On January 8th of this year in Berkeley, CA, Hillphoenix, Emerson Climate Technologies, and AHT Cooling Systems USA brought together supermarket refrigeration executives and representatives from the nation’s major utilities to discuss ways that utilities could help boost demand for energy-efficient natural refrigerant equipment. After discussing energy incentives for self-contained refrigeration units that employ hydrocarbons (see Part 1 of this article, in the March issue of Accelerate America), the group turned its focus to incentives for supermarket refrigeration systems that use natural refrigerants. The typical store-wide system uses about 3,000-4,000 pounds of HFC refrigerant, usually R404A, which pound-for-pound has a global warming impact that is almost 4,000 times worse than carbon dioxide’s. Supermarkets leak on average about 25% of that refrigerant every year – about 750-1,000 pounds. To put the problem in perspective, that is about 4 million pounds of CO2 -equivalent leaked every year by each supermarket, or 140 billion pounds leaked by the nation’s 35,000 supermarkets. (That is ten zeroes after the number fourteen.) If you want to see how much that is in terms of number of cars on the road, go to the EPA’s greenhouse gas calculator HERE . It’s a nifty little tool that helps us regular people understand the effect of different greenhouse gas emissions relative to each other. To be clear though, most utilities don’t care one iota about the direct emissions from refrigerant leaks. In fact, many utility regulatory bodies don’t allow their utilities to look at greenhouse gas emissions. All that matters to most utilities across the country is energy use. Though many utilities advertise their incentive programs under the auspices of energy efficiency and the corresponding environmental benefits, incentives are a pure cost-benefit calculation for utilities. It is cheaper for utilities to pay people and businesses to use less energy than it is to build a new power plant. Period. So in order to interest utilities in natural refrigerants, you have to come to them with an energy efficiency argument. As discussed in last month’s article, this argument is a no-brainer when it comes to self-contained equipment. The argument for energy savings with natural-refrigerant systems is equally compelling, but it is not a no-brainer. The crux of the complexity in determining how much energy a new natural refrigerant supermarket system is going to use lies both in the lack of actual energy data, because the energy consumption has to be estimated before the new store is built, and in the lack of some kind of a baseline against which you’d measure an energy efficiency improvement, because there is no useful national average for the energy usage of a supermarket. Aaron Daly, Global Energy Coordinator at Whole Foods Market, cited the analogy of the electric car to describe the wholesale shift in approach necessary for natural refrigerants. “We aren’t talking about a car that uses a more efficient gasoline engine; we are talking about a complete shift in the way we do things – an electric vehicle, if you will,” said Daly. In order for utilities to take advantage of the energy efficiency opportunities that will come from natural refrigerant systems, they’ll need to change the way they do things to a certain extent. Instead of looking at individual components and adding up the energy savings that are achieved by each component, utilities will have to adopt a whole-system approach to energy savings. Why should utilities get involved, if this is so complicated? Because the potential savings, ranging from 10% to 30%, are worth it. In other words, a utility can either try to get 33 homes to stop using electricity completely, or they can help a supermarket install a natural refrigerant system in a new store. As stated in last month’s article, the main thing that is preventing more supermarket companies from using natural refrigerants in new stores currently is the cost hurdle. Because there are only a few of these natural refrigerant systems in the U.S., equipment manufacturers cannot take advantage of economies of scale. There just isn’t enough of a market yet for manufacturers to start producing natural refrigerant components here in the U.S. According to Derek Gosselin, Product Manager, Systems Division for Hillphoenix, about 25-30% of the components for a CO2 transcritical system are still imported from overseas. Luckily, utility incentives can be quite effective in counteracting the additional costs that often accompany new energy-efficient technologies. This inspires additional sales, which brings costs down, resulting in a virtuous cycle that culminates in the price of natural refrigerant technologies equaling or even beating that of conventional technologies. So how do we get this party started? Utilities and supermarkets agree on the essential factors in utility programs for natural refrigerant incentives: they have to be easy, transparent, and flexible. Ideally, utilities’ methodologies for natural refrigerant incentives would have enough in common across geographies to be somewhat replicable. However this is a challenging notion for individual utilities, which often don’t care about any methodology but their own. But for supermarkets, which may deal with a different utility for every new store, having a methodology that crosses utility borders is essential. “If we could get utilities to at least agree on a set of principles for how these projects would be handled, it would be enormously beneficial for us,” said Harrison Horning, Director of Energy & Facilities at Delhaize America, which deals with dozens of utilities across the Northeast, the Mid-Atlantic, and the Southeast. Transparency and flexibility, the other essential characteristics of natural-refrigerant utility incentive programs, might seem to be in opposition to each other, but both are essential for a successful program for supermarkets. As stressed in the Berkeley workshop, a flexible and transparent model is needed to predict the energy consumption of a new store at the design phase, as well as a baseline against which the energy efficiency improvements would be compared. With a multitude of models available on the market, the hard part isn’t coming up with one. It is to get utilities and supermarkets to agree on which model to use. Every model has its flaws; but for utility incentive projects for new stores that will use natural refrigerants, there is no alternative but to rely on modeling when predicting the energy usage of a store that is yet to be built. Most at the workshop agreed that the question of a baseline is the more complicated question. Once you have modeled the energy usage of a natural refrigerant system in a new store, what do you measure it against? The choices are numerous. Do you measure the new store’s energy consumption against a national average for all stores? The only thing that is certain about a national average is that it will likely be irrelevant for any one particular store. What about a regional average? That would be more relevant for a particular store in terms of the ambient air temperature in a region, but it probably won’t correspond to the size or the cooling capacity of a particular store, and it might not have anything to do with the standard refrigeration technology used by a particular company. It wouldn’t make sense to use a centralized DX system as a baseline for a company that hasn’t built that type of system for over a decade. The consensus at the workshop seemed to be that an ideal baseline is whatever the company would have built in that spot instead of the natural refrigerant system. So for a company like Target, for instance, which said last year that its standard system for new stores will be a CO2 cascade system, you’d use a CO2 cascade system as the baseline. Of course, the chances aren’t high that Target has a store already in operation right down the block that can be used as the baseline. So even in a situation where a company has declared a standard technology, the baseline question still isn’t easy to answer. You could take actual numbers from a store that is close to the new site, and try to determine the extent to which energy usage would differ at the new store. You could take an average of the energy usage data from the company’s existing stores in the region. You could also ask the company that is applying for the incentive to draw up a store plan for the technology that would have been used, if not for the natural refrigerant choice, and then model the energy consumption of that store. Many would see this as a useless exercise, but it might actually save a lot of time vs. some of the other baseline possibilities. How to we get utilities to agree on one of these baseline methodologies? We don’t. The purpose of the workshop was not to get everyone to agree on one universally acceptable methodology for every project. The purpose was to come up with a set of transparent methodologies affording the flexibility to pick the best for each individual project. Perhaps with additional discussion, utilities and supermarkets can come up with a hierarchy of baseline methodologies. If a company has a standard methodology, with actual energy usage data from another nearby store that is relevant, use that as the baseline. If a company has a standard methodology, but does not have actual energy consumption data from an existing store close to the new store’s location, use a regional average of several of the company’s stores that are within a certain radius of the new store. If a company does not have a standard technology that would have been installed in the store under consideration, take the alternative store design that wasn’t chosen, under the assumption that it would have been used but for the natural refrigerant technology chosen instead. And so on. That might sound complicated and time consuming, but according to all participants in the workshop, it cannot possibly be as time consuming and complicated as starting anew, from scratch, for every new store, in every region, with each different utility. Nothing is worse than that. Those who look to natural refrigerants as the ultimate solution to the cycle of never-ending refrigerant phaseouts have been discussing for several years the hurdles that need to be overcome to accelerate their adoption in the U.S. Above all, the biggest hurdle is cost. As is usual with technology that has recently come on the scene in the U.S., the cost of natural refrigerant equipment is higher than that of typical HFC equipment. This is to be expected. The commercial refrigeration industry has had decades to fine tune conventional equipment and drive out inefficiencies. Competition among conventional equipment manufacturers who sell very similar products has kept prices low, and these manufacturers have been able to take advantage of the economies of scale that come with large sales volumes. Eventually natural refrigerant equipment will get to that point also. In the meantime, the industry is in a catch-22: few are willing to purchase equipment that uses naturals until the price comes down, but manufacturers cannot bring the price down until more people purchase this equipment. Greater demand in the U.S. would spark a virtuous cycle of events. For example, many of the components for natural equipment are now imported from Europe or Japan, but with increased demand in the U.S., component manufacturers could set up operations here. More customers would also encourage more manufacturers to enter the market, and these companies would compete with each other for business and look for ways to reduce prices. Other hurdles to natural refrigerants would also be solved with greater volume, including the need for technician training, the lack of real data from stores that allow for equipment improvements, and the shortage of longer-term data on installation and maintenance costs. If there were enough work on natural refrigerant systems for large numbers of technicians, service companies would invest in training, because they would get a return on their investment. And with greater experience with natural refrigerants across a broader base of end users, supermarkets would share data with each other and work with manufacturers to further improve products. The very fact of more units in use would generate robust data on all facets of the lifecycle cost equation. So how can we spike demand for natural systems and thereby solve our catch-22? An attempt to answer this question took place on January 8th at an industry workshop in Berkeley, California. Sponsored by Hillphoenix, Emerson Climate Technologies and AHT Cooling Systems USA, the meeting brought together supermarket refrigeration executives, utility representatives, equipment manufacturers, and others to discuss ways to boost demand for equipment that uses natural refrigerants and saves energy. refrigerant equipment brings significant energy savings vs. conventional equipment, which makes them of interest to utilities. Bringing utilities into the equation is a “key stepping stone in the investment and hard work that is going to be required to make natural refrigerants mainstream,” according to Mitch Knapke, Director at Emerson Climate Technologies, one of the sponsors of the workshop. The day-long workshop tried to “surface some good ideas of how and where to get traction with utility incentive programs,” said Harrison Horning, director of equipment purchasing, maintenance and energy, for Delhaize America. Based on those numbers, an average supermarket with 12 self-contained hydrocarbon units saves about 20,000 kWh annually per store. Multiplying the 20,000 kWh per store by the 37,459 supermarkets in the US (according to the Food Marketing Institute) results in a rough, back-of-the-napkin potential savings for supermarkets of 771,130,974 kWh per year. In fact, the savings would likely be higher than that, because the older HFC units that would be switched out likely use more energy than a new HFC unit. Of course, this quick analysis assumes that all 12 cases in an average store are 4-5 foot self-contained spot cases. Taking the analysis one step further, if the average kWh price for electricity is a flat ten cents, U.S. supermarkets would save over $77,000,000 per year in electricity costs. That sounds like a lot. And it is, though in total our nation’s supermarkets spend about $8-$10 billion per year on electricity. The premise at the start of the workshop was that prescriptive incentives for new self-contained hydrocarbon units are as close to a no-brainer as you can get in supermarket refrigeration. It should be as easy as comparing the annual electricity usage of a new hydrocarbon unit with the annual electricity usage of the same new unit that uses an HFC refrigerant. In other words, the hydrocarbon unit is compared to what the supermarket would have bought if the hydrocarbon unit did not exist. 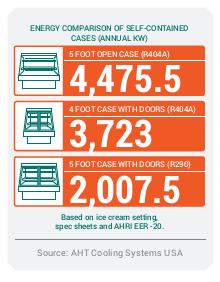 Just as with a washing machine or a home refrigerator, the annual energy use of self-contained refrigeration units is tested and listed in the equipment’s spec sheets. If utilities don’t trust manufacturers’ energy usage data, wouldn’t it be as easy as plugging both units into the wall next to each other in an independent lab to measure their energy consumption? If those numbers still aren’t good enough, there will soon be another source: the Department of Energy. By January 1, 2016, all manufacturers of self-contained commercial refrigeration units must measure, certify, and file with the DoE the daily energy consumption in kilowatt-hours per day of each model they sell. The DoE mandates that manufacturers use the “uniform test method for the measurement of energy consumption of commercial refrigerators, freezers, and refrigerator-freezers.” Utilities can easily use those numbers as the basis for their incentive calculations. Replacing old self-contained units with new ones is slightly more complex. Does one measure the actual electricity usage of the existing unit first and use that consumption number as the basis for the prescriptive incentive? What about the ancient HFC unit that everyone admits shouldn’t even be used anymore? Is it fair or desirable to use that as a baseline for an incentive? Or does one just assume that every existing HFC unit in stores uses an average amount of electricity and base the incentive on that? Or for simplicity’s sake, how about taking the energy usage of a new HFC unit as the baseline, regardless of how much electricity the old HFC unit consumes? Utilities, supermarkets, and equipment manufacturers could spend a very long time evaluating all of those options to determine the perfect methodology. Or they could decide to not let the perfect interfere with the good and pick the most conservative option for utilities and go with that. Supermarkets might not receive as much of an incentive as they would with one of the other options, but at least they’d get more than they are currently receiving – nothing. And they’d start getting something a lot sooner than if utilities spend a very long time figuring out the perfect solution to all of these questions. As with other utility incentives, the role of this incentive is to stimulate sales of new energy-efficient equipment while it is still more expensive, allowing manufacturers to achieve the economies of scale that come with larger volumes. Once the market demand is high enough to justify manufacturing components and cases in the US, the cost of hydrocarbon self-contained units will automatically come down. And once the price comes down to levels that are comparable to those of conventional self-contained cases, utility incentives won’t be necessary anymore. The ideas discussed in the workshop are already bearing fruit, with innovative utility companies in California hoping to have a prescriptive rebates program in place by mid-summer 2015 for hydrocarbon self-contained units, according to Howell Feig, sales director for AHT Cooling Systems USA. “The opportunity for prescriptive incentives/ rebates for natural refrigerant solutions is in the very near future,” noted Leigha Joyal, energy analyst at Hillphoenix. Moveable, self-contained hydrocarbon cases may be in your future. Imagine a world where merchandising people and refrigeration people live in perfect harmony. Most people who work in one of these two areas will claim to get along fine, but behind the scenes they’ll admit to frustration with each other. Refrigeration people admit to this frustration more readily, probably because merchandising often comes out on top in situations where the groups’ interests don’t coincide. There is hope for kumbaya in the future — and it lies in hydrocarbon self-contained units. These cases offer greatly improved merchandising op­portunities, as well as energy savings and decreased maintenance costs. Imagine being able to move frozen and refrigerated cases around the store wherever and whenever you want. Move chilled whipped cream next to your strawberries. Put some brie and bacon next to your figs and some fresh mozzarella and basil next to your heirloom tomatoes along with recipes for broiled bacon-wrapped figs stuffed with brie and mozzarella caprese. Move your hot dogs and hamburgers next to your beer for the 4th of July holiday. Put your specialty European butters next to your Dunge­ness crabs. Create space in your store for people to stop in on their way home from work to pick up everything they need for a meal. Put a main course, salad, chilled white wine, and fruit for dessert right at the front of the store and take some business away from your local fast food chains. I’m not a merchandising specialist, but I am a shopper, and I can tell you that I’d appreciate ideas like that. You know who else might appreciate ideas like that? Refrigeration people. Why? Hydrocarbon self-contained units can achieve energy savings of up to 40%, according to a presentation given by the self-contained case manu­facturer, AHT Cooling Systems, at a utility workshop in January. These cases come factory-sealed for leak tight­ness, which reduces refrigerant expenses and mainte­nance costs, and the installation of the cases is as simple as plugging them in. Today, most systems have refrigeration equipment in a separate room, with piping running to and from fixed-location cases. This system traditionally used less energy than a store filled with self-contained cases. But the improved energy efficiency of hydrocarbon self-contained cases may make it more economical to take some cases off the remote system. 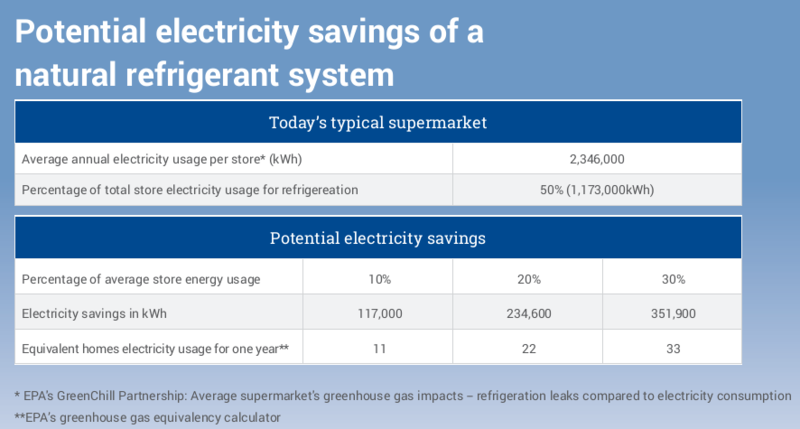 Savings can be sub­stantial, considering that refrigeration usually accounts for about half of a store’s energy use. Compared with earlier self-contained cases, today’s hydrocarbon units feature more display area and packout as well as lower levels of noise and heat generation. Testing has shown that the compressors in new hydro­carbon self-contained cases are quieter than remote case evaporator coil fans, and the heat that would be rejected from the self-contained cases into the store can be elimi­nated by dissipating it through a chilled water loop. This makes it more difficult to move the case around at will, but it doesn’t make it impossible. I am eager to see some energy numbers from store pi­lot projects with hydrocarbon cases and hear merchan­disers’ opinions on them in real store situations. This may be something that merchandisers and refrigeration people can both embrace wholeheartedly. I suggest you all get started on having conversations about the poten­tial, ideally over a nice, cold beer. Are you looking in the right places for unbiased opinions about your systems and refrigerants? One of the first things I learned about refrigerants and supermarkets is that there is never one right answer, regardless of the question. Doors on cases? It depends on lots of factors, including the case contents, the types of shoppers that frequent your store, how old the cases are, and, perhaps most im­portant, how much deference your management gives to your merchan­dising people. Best type of refrigeration system? It depends in part on the layout of the store, the location of the store, the amount of money available, and, it seems, a lot of hearsay about the downfalls and dangers of the various types of systems that you yourself have never tried. I could go on and on. You name an issue in commercial refrigera­tion, and I’ll tell you that the answer depends on X, Y, and Z. One of the most polarizing issues in our industry is the right strategy for approaching the environmental harm caused by refrigerant emis­sions. There are two main camps: those who believe that the answer to this problem is leak tightness and those who believe that the answer lies in environmentally friendlier refrigerants. The leak tightness camp proclaims readily and willingly that the refrig­erant is not the problem. It doesn’t matter if a specific refrigerant harms the ozone layer or if it is the most potent global warming gas on the planet. If the refrigerant doesn’t leak, it doesn’t cause any harm. Therefore, we shouldn’t regulate refrigerant type; we should install commercial systems that never leak and make sure that service techs are trained in best practices. The people who believe that the answer to the harm caused by refrig­erant emissions lies in using refriger­ants that are not harmful will tell you that there is no such thing as a leak-tight system. They point out that re­frigerant emissions are often outside of human control. Components fail without warning. Natural disasters result in catastrophic leaks. Copper theft can cause a store to lose its en­tire charge overnight. They also refer to human error. I myself am fond of mentioning the inattentive high school forklift driver who bangs into a display case. I have no idea whether high schoolers are even allowed to drive forklifts in supermarkets, but I keep using this example because I think it gets the point across. So what’s the answer? I’d like to say “it depends.” But this is an issue where “it depends” doesn’t really work. It boils down to your funda­mental world view, similar to wheth­er you believe that guns kill people or that people kill people, or perhaps more aptly, whether the answer to our energy future lies in renewables or cleaner fossil fuels. Needless to say, though I’m saying it anyway, there is a lot of money at stake in all of these areas. Not surprisingly, many chemi­cal manufacturers and the associa­tions that represent them belong to the camp that professes that the refrigerant is not the problem. As the EPA focuses more on low GWP refrigerants, this camp will become more vocal about the need to better communicate best practices for leak tightness and leak prevention, the need for more training, and better enforcement of Section 608 of the Clean Air Act. They don’t want to seem blind to the problem, so they’ll focus the blame for the environmen­tal harm somewhere other than on the refrigerant. Also not surprisingly, many envi­ronmental organizations belong to the camp that believes that refriger­ants will always leak, so the industry needs to move to refrigerants that do not harm the environment when emitted. This camp often makes broad, sweeping pronouncements about what everyone in the indus­try is doing wrong, without offering much in the way of concrete solu­tions to the hurdles that stand in the way of adopting environmentally-friendlier refrigerants. Though I find systems manufac­turers to be more agnostic, their agnosticism mainly comes from their desire to sell to all end-users regard­less of their own opinions. Most of these manufacturers will, however, suggest that you try to reduce your HFC charge as much as possible and that you invest in a system that prevents HFC refrigerant leaks. They offer refrigeration systems that reduce the amount of HFC refrigerant needed by anywhere from 75%-90%. They also offer systems that use only natural refrigerants. Depending on how they posi­tion themselves in the market, they will focus more or less on these attributes as the key for your preparation for future regulations and market developments. However, if an end-user comes to these manufacturers wanting the leakiest type of system that uses the most 404A they can pump into it, most will also gladly sell that type of system. They might even take this end-user out to dinner and gladly agree that all this environmental nonsense is a load of hogwash. If you get the impression that I feel this is an area where beliefs have a lot to do with money, you’d be ab­solutely right. Cynical? Maybe. I prefer the term bluntly realistic. The term “cynical” suggests that I feel there is something wrong with all parties in this industry try­ing to make a living. I don’t see anything at all wrong with that. The problem in this situ­ation is when end-users, in trying to figure out what is best for their stores, gather information from people who are trying to sell them some­thing and never ask them­selves whether they are being presented with the whole picture. What baffles me is that these end-users are usu­ally the types of people who consult Consumer Reports or some other neutral source of information before purchas­ing a flat screen TV. They ask their friends who have flat screen TVs for their opin­ions on the pros and cons of various models. They under­stand that the flat screen TV salesperson may be trying to push one particular model or another based on the amount of commission he or she stands to earn. Yet when it comes to million-dollar decisions related to refrigerants and refrigeration systems, decision-makers rely on infor­mation from people who have a vested monetary interest in their decisions. The best source of neutral, user-friendly information that I know of is the EPA’s GreenChill Partnership. Lest you think that this organization escapes my cynical or bluntly realistic viewpoint, I readily admit that this neutrality is mostly due to the competitors that belong to the partnership keeping each other honest. The vari­ous best-practice guidelines, for instance, are written by groups of competitors. Any hint that a team member is trying to swing the document in his or her company’s favor is gleefully pointed out by multiple parties. Yes, there are situations where a whole group of competitors have the same economic interest, but the guidelines are peer reviewed by end-users and other industry stake­holders, too. They then go through a lengthy process of EPA review, where the pressure to eliminate anything that resembles a definitive statement is great. Neverthe­less, the result of this whole process is a set of pretty good guidelines. The guidelines don’t answer all of your questions on any one topic, but they do point out the questions that you should be asking yourself and anyone who is trying to sell you something. As long as end-users rely on salespeople for the information they use to make million-dollar deci­sions about which system to install in a new store or which refrigerant to use as their standard, this whole is­sue will, in fact, boil down to “it depends.” Unfortunately, in this case, the factors in the “it depends” equation are who you get your information from, what they are trying to sell you, and how much of it they are trying to sell. Will the Montreal Protocol Get Anywhere with HFCs This Year? Should You Care? Those of you who follow this type of thing will know that the annual Montreal Protocol negotiations are going on right now in Paris. The US is (again) trying to get HFCs added to the meeting agenda so that formal discussions on incorporating HFCs into the treaty can officially begin. The US has attempted to get this topic on the agenda for the past several (five?) years, but other countries have protested and prevented the topic from even being discussed as part of the official meeting. The US has tried in the past to proceed with their proposal by holding unofficial side meetings on HFCs with interested countries, but as the term “side” meetings suggests, these meetings have been sideshows, while the main event has proceeded with nary a mention of HFCs. The main blocker last year was India, but thanks to a recent agreement between President Obama and Prime Minister Modi (of India), India did not prevent discussions from starting this year. Good, right? Kind of. You see, Saudi Arabia, Kuwait, and Bahrain DID protest against the topic of HFCs being taken up this year. What does that mean? We’ll see. Some would say that you shouldn’t. Even if HFCs stay on the agenda, and official conversations on amending the Protocol begin, it might take the governments of the whole world a bit of time to discuss the issue and agree on terms. How long do you think it will take for close to 200 governments to come to agreement? On top of that, the current proposal would start in 2018 and only reach very significant cuts in 2030-2035. The chemical manufacturers are already talking about pushing that timeline back. Will anyone still want or need to use HFCs in 2040? Perhaps, but I’d hope we are already beyond that. Also, the US EPA is currently taking action on its own to regulate HFCs, so the chances are high that we will already be well beyond the Montreal Protocol limits when and if they do go into effect. One reason you might care is that if the Montreal Protocol is amended to include HFCs, it would be the first time that the US signs an international climate change agreement. Of course, those involved will go out of their way not to call it a climate change agreement – they’ll call it an HFC agreement or something else that they hope won’t get Senator Inhofe all riled up. Another reason you should care is that US obligations under a Montreal Protocol amendment would make the EPA’s HFC regulations somewhat immune to politics. The current actions by the EPA on HFCs are being pushed by the Obama administration under his executive power. A new administration in 2017 could have a very different agenda, and a new EPA Administrator could theoretically put the kibosh on future HFC regulations altogether. A Montreal Protocol Amendment would make action by the EPA on HFCs mandatory, because any administration is required to follow an international treaty that has been signed by the US.